NEW for 2011! While the original FEED Bag is no longer available from Amazon.com, you can get a much, much more stylish and comfortable Denim Bucket Tote or Canvas Tote from the Gap. Here is a great idea from Lauren Bush and Amazon.Com just in time for your holiday shopping. 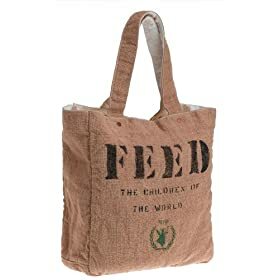 Starting on Thanksgiving Day 2007, you can order a charity shopping bag, the World Food Programme FEED Bag on Amazon.Com. For less than the price that most people pay for Thanksgiving dinner, you can feed a hungry child for a full year. Reusable cloth shopping bags have become a huge trend–and a fashion craze–in the past few months. Designers like Stella McCartney and Hermes have sold bags for hundreds of dollars. Taking a cue from this trend, UN World Food Program honorary spokesperson Lauren Bush came up with the idea of selling these charity shopping bags. The bags are sturdy, made of natural burlap and cotton. They are also stylish–the bag is a reversable design: one side looks like the kind of burlap bags that the UN uses to deliver food to children around the world; the other is a stylish white bag you can coordinate with any outfit. Most importantly, they are a great way to show you care, and a great conversation starter about this critically important topic. Last year, the UN World Food Program charity fed 16 million children at schools. But there is a long way to go. The UN estimates that there are 300 million children around the world who routinely go hungry. By buying this bag, you will be providing one child with enough food for one school year. By using the bag for your shopping, you will also be helping the environment by reducing the number of plastic bags. It’s not often that $59.95 goes so far. You actually produced some remarkable tips with ur blog post, “Charity Shopping Bags: Feed the children of the world with the FEED Bag”. I am going to wind up returning to your blog eventually. These charity shopping bags can help many hungry people. This is a great way to provide food for the hungry children.